--- How LA MASCHERA DEL DEMONIO survived the 1961 censors (or didn't). Mario Bava's 1960 Italian horror hit La maschera del demonio introduced horror queen Barbara Steele to terror films and jump-started a decade of horror cinema in Europe. It's considered a must-see for horror aficionados, a movie that relates well to lovers of classic cinema, and modern fans more attuned to graphic violence and disturbing imagery. Two traveling doctors accidentally revive a sorceress tortured to death hundreds of years ago; she becomes a living corpse who seeks to possess the body of a descendant. 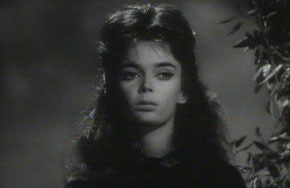 Barbara Steele plays both roles; the film brims over with images both hauntingly beautiful and creepily unnerving. Steele's entrance as Princess Katia ... an icon is born. There's no shortage of writing to be found on Black Sunday (its American Title); pick up any book on movie horror and there'll be plenty to read on the subject. 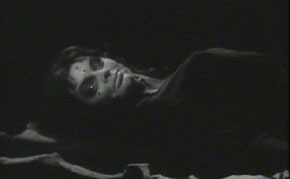 Most sources cite it as the best Italo horror film of the 60s, the best film by director Bava and star Steele. What is of interest here is the story of Black Sunday's censor woes in England and the United States. The A.I.P. publicity files have yielded some fairly surprising insights. In 1960, La maschera del demonio was a film begging to be stomped on by the censors. It is likely that it was also censored in European countries; for all we know here in the US, Italian audiences didn't see the entire film on its first go-round either. Censorship of the more arcane Euro horrors may have contributed to the seemingly permanent loss of much of the content of titles like Mill of the Stone Women. Films of the period that have had to be partially reconstructed include hits like Eyes Without a Face and the then-reviled Peeping Tom. For England and America in 1960, there was nothing particularly mysterious or unfair about the censor demands delineated below. Back from the dead and ready to wreak havoc ... if the censors allow her. Anglo-Amalgamated's Nat Cohen submitted the Italian film, already retitled Black Sunday by A.I.P., to the Soho offices of John Trevelyan, the famous censor whose name crops up time and time again in accounts of British Censorship. Most recently, in a book about director Ken Russell, Trevelyan comes off as a fairminded gentleman when negotiating cuts in the release version of 1973's shocking The Devils. Trevalyan and his Board of Examiners clobbered Black Sunday plain and simple. After forcing Anglo-Amalgamated to amend the film with cuts, on a second screening they decided to deny it any kind of certificate, not even the adult "X". For them the film was too gory, outright disgusting in places, beyond the limits of what a horror film should show. Trevelyan advised Cohen to make it clear to A.I.P. that any similar future films would be denied certification as well. Perhaps this was a backlash from Peeping Tom (1960) and The Stranglers of Bombay (1959), both of which elicited calls for a censorship purge. 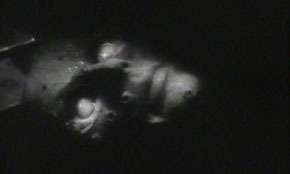 Even Hammer films seem to have undergone a crackdown: by some accounts, Hammer's The Phantom of the Opera (1962) was exhibited in England without its fairly tame unmasking scene. And censorship has been theorized as one possible cause for the mysterious delay of the release of These are the Damned from 1961 to 1963 (1965 in the US). In England no certificate meant no release, period. The only places Black Sunday could have screened in Great Britain would have been private clubs and perhaps museums, in the unlikely chance that contemporary horror films were being celebrated at the time. La maschera del demonio joined the rather exclusive company of films banned outright in England: Freaks and The Island of Lost Souls among others. Only later did Black Sunday surface in England, for a time confusingly retitled Revenge of the Vampire. Scorpions and other crawlies from the grave. 1) The branding of the witch. The actual touching of the branding iron to her flesh, with the skin melting. 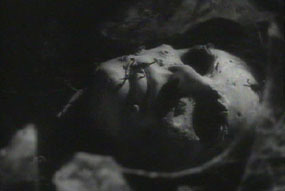 2) The shot where the mallet strikes the witch's mask, where blood can be seen to spurt out of the eyes of the mask. 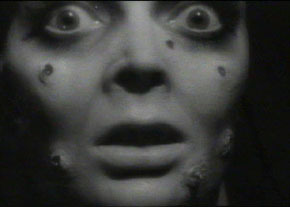 3) The entire scene showing maggots and scorpions crawling on the witch's face. (see SCORPION image above). 4) The close-up of Steele's scarred face when she commands Professor Krubajan to kiss her (Image at the top of this article). 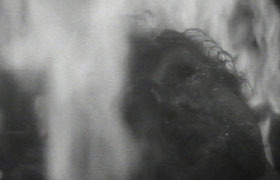 5) The close-up of the father's face burning in the castle hearth in the last reel. The interesting thing about this list is that the even though the MPAA insisted all these cuts be made, it looks as if only one of them actually was done to the US release! (NOTE: the DVD release of the English 'Mask of the Demon' uncut version makes the original text of this article inaccurate ... 12/15/99 corrections follow in RED. )The slow truck-in to the witch's scarred face ordering Krubajan to 'kiss me, kiss me' fades out prematurely in the A.I.P. cut (the track continues untrimmed, a nice touch). Cassettes of the slightly longer English version push in further to a choker close-up of Barbara Steele's eyes, framed by the hideous puncture scars of the Mask of Satan. Perhaps Arkoff, realizing that this horror film would fail if stripped of its roughest moments, negotiated with the MPAA and got most of the above forgiven. The advertising for the film does contain the warning banner "not recommended for those under 13 years of age" - was that the tradeoff? One film, two countries. In England, an outright ban. In the United States, a slap on the wrist. The cynic in Savant speculates that Black Sunday would have had a much rougher fate in America if it proffered any real sexual content (the MPAA must have been blind to the carnal appeal of Ms. Steele) or, God forbid, political ideas as rough as its horror imagery. This time, Sam Arkoff and James Nicholson did it right, and gave us our first taste of Italo terror senza restrizioni. Text © Copyright 1998 Glenn Erickson.